Co-vasotec 80/12.5 mg Film coated Tablets: Film coated tablets containing 80 mg Valsartan and 12.5 mg Hydrochlorothiazide. Co-vasotec 160/12.5 mg Film coated Tablets: Film coated tablets containing 160 mg Valsartan and 12.5 mg Hydrochlorothiazide. 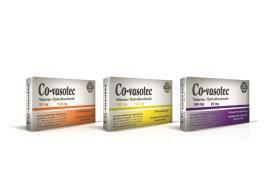 Co-vasotec 160/25 mg Film coated Tablets: Film coated tablets containing 160 mg Valsartan and 25 mg Hydrochlorothiazide. Co-vasotec 80/12.5 mg & 160/12.5 mg F.C. Tablets: Microcrystalline cellulose PH101, Povidone K25, colloidal silicon dioxide, crosscarmellose sodium, microcrystalline cellulose PH102, magnesium stearate, hydroxypropyl methylcellulose, polyethylene glycol 400, polyethylene glycol 6000, titanium dioxide, iron oxide red, iron oxide yellow. Co-vasotec 160/25 mg F.C. Tablets: Microcrystalline cellulose PH101, Povidone K25, colloidal silicon dioxide, crosscarmellose sodium, microcrystalline cellulose PH102, magnesium stearate, hydroxypropyl methylcellulose, polyethylene glycol 400, polyethylene glycol 6000, titanium dioxide, iron oxide yellow. Co-vasotec (valsartan and hydrochlorothiazide (HCTZ), USP) is indicated for the treatment of hypertension. Co-vasotec may be used in patients whose blood pressure is not adequately controlled on monotherapy. Co-vasotec may be used as initial therapy in patients who are likely to need multiple drugs to achieve blood pressure goals. The choice of Co-vasotec as initial therapy for hypertension should be based on an assessment of potential benefits and risks. Patients with stage 2 hypertension are at a relatively high risk for cardiovascular events (such as strokes, heart attacks, and heart failure), kidney failure, and vision problems, so prompt treatment is clinically relevant. The decision to use a combination as initial therapy should be individualized and should be shaped by considerations such as baseline blood pressure, the target goal and the incremental likelihood of achieving goal with a combination compared to monotherapy. Individual blood pressure goals may vary based upon the patient's risk. Data from the high dose multifactorial trial provides estimates of the probability of reaching a target blood pressure with valsartan and hydrochlorothiazide compared to valsartan or hydrochlorothiazide monotherapy. For example, a patient with a baseline blood pressure of 160/100 mmHg has about a 41% likekhood of achieving a goal of < 140 mmHg (systolic) and 60% likelihood of achieving < 90 mmHg (diastolic) with valsartan alone and the likelihood of achieving these goals on HCTZ alone is about 50% (systolic) or 57% (diastolic). The likelihood of achieving these goals with valsartan and hydrochlorothiazide rises to about 84% (systolic) or 80% (diastolic). The likelihood of achieving these goals on placebo is about 23% (systolic) or 36% (diastolic). The recommended dose is one tablet of Co-vasotec 80/12.5 per day. In the event of an inadequate response after treatment for 3-4 weeks, it may be necessary to continue treatment with one Co-vasotec 160/25 tablet daily. Use of Co-vasotec 160/25 tablet (1 Co-vasotec 160/25 tablet per day) is restricted to those patients in whom adequate reduction of blood pressure is not achieved with Co-vasotec 160/12.5 tablet. The maximum antihypertensive effect is seen within 2-4 weeks. Co-vasotec can be taken independently of meal times. It should be swallowed with liquid. Co-vasotec can be taken by patients of any age. Dose adjustment is not necessary in patient with mild to moderate renal failure (creatinine clearance ≥ 30 ml/min) or mild to moderate hepatic failure (see Warnings and Precautions). There is insufficient experience of the therapeutic use of valsartan+hydrochlorothiazide in children and adolescents. Hypersensitivity to any of the ingredients of Co-vasotec or sluphonamide derivatives. In patients with hereditary angioedema or in those who had developed angioedema during treatment with an ACE inhibitor or an angiotensin II receptor antagonist. Pregnancy (see Pregnancy and Lactation). Severe hepatic failure, biliary cirrhosis and cholestasis. Severe renal impairment (creatinine clearance < 30 ml/min) or anuria. Treatment resistant hypokalaemia, hyponatraemia, hypercalcaemia, and sytmptomatic hyperuricaemia (history of gout and uric acid calculi). The concomitant use of Co-vasotec with aliskiren-containing products is contraindicated in patients with diabetes mellitus or renal impairment (GFR < 60 ml/min/1.73 m²). There is evidence that the concomitant use of ACE-inhibitors,angiotensin II receptor blockers or aliskiren increases the risk of hypotension, hyperkalaemia and decreased renal function (including acute renal failure). Dual blockade of RAAS through the combined use of ACE-inhibitors, angiotensin II receptor blockers or aliskiren is therefore not recommended . Valsartan+Hydrochlorothiazide can cause foetal harm when administered to a pregnant woman. If Co-vasotec is used during pregnancy, or if the patient becomes pregnant while taking this drug, the patient should be apprised of the potential hazard to the fetus. Drugs that act on the renin-angiotensin system can cause fetal and neonatal morbidity and mortality when used in pregnancy. In several dozen published cases, ACE inhibitor use during the second and third trimesters of pregnancy was associated with fetal and neonatal injury, including hypotension, neonatal skull hypoplasia, anuria, reversible or irreversible renal failure, and death (see Use in Specific Populations). Excessive reduction of blood pressure was rarely seen (0.7%) in patients with uncomplicated hypertension treated with valsartan+hydrochlorothiazide in controlled trials. In patients with an activated renin-angiotensin system, such as volume- and/or salt-depleted patients receiving high doses of diuretics, symptomatic hypotension may occur. This condition should be corrected prior to administration of Co-vasotec, or the treatment should start under close medical supervision. If hypotension occurs, the patient should be placed in the supine position and, if necessary, given an intravenous infusion of normal saline. A transient hypotensive response is not a contraindication to further treatment which usually can be continued without difficulty once the blood pressure has stabilized. Hydrochlorothiazide: Thiazide diuretics should be used with caution in patients with impaired hepatic function or progressive liver disease, since minor alterations of fluid and electrolyte balance may precipitate hepatic coma. Valsartan: As the majority of valsartan is eliminated in the bile, patients with mild-to-moderate hepatic impairment, including patients with biliary obstructive disorders, showed lower valsartan clearance (higher AUCs). Care should be exercised when administering Co-vasotec to these patients. Hydrochlorothiazide: Hypersensitivity reactions to hydrochlorothiazide may occur in patients with or without a history of allergy or bronchial asthma, but are more likely in patients with such a history. Hydrochlorothiazide: Thiazide diuretics have been reported to cause exacerbation or activation of systemic lupus erythematosus. Hydrochlorothiazide: Lithium generally should not be given with thiazides. Valsartan+Hydrochlorothiazide: In the controlled trials of various doses of the combination of valsartan and hydrochlorothiazide, the incidence of hypertensive patients who developed hypokalemia (serum potassium < 3.5 mEq/L) was 3.0%; the incidence of hyperkalemia (serum potassium > 5.7 mEq/L) was 0.4%. In controlled clinical trials of valsartan+hydrochlorothiazide, the average change in serum potassium was near zero in subjects who received valsartan+hydrochlorothiazide 160/12.5 mg, 320/12.5 mg or 320/25 mg, but the average subject who received valsartan+hydrochlorothiazide 80/12.5 mg, 80/25 mg or 160/25 mg experienced a mild reduction in serum potassium. In clinical trials, the opposite effects of valsartan (80, 160 or 320 mg) and hydrochlorothiazide (12.5 mg) on serum potassium approximately balanced each other in many patients. In other patients, one or the other effect may be dominant. Periodic determinations of serum electrolytes to detect possible electrolyte imbalance should be performed at appropriate intervals. Hydrochlorothiazide: All patients receiving thiazide therapy should be observed for clinical signs of fluid or electrolyte imbalance: hyponatremia, hypochloremic alkalosis, and hypokalemia. Serum and urine electrolyte determinations are particularly important when the patient is vomiting excessively or receiving parenteral fluids. Warning signs or symptoms of fluid and electrolyte imbalance, irrespective of cause, include dryness of mouth, thirst, weakness, lethargy, drowsiness, restlessness, confusion, seizures, muscle pains or cramps, muscular fatigue, hypotension, oliguria, tachycardia, and gastrointestinal disturbances such as nausea and vomiting. Interference with adequate oral electrolyte intake will also contribute to hypokalemia. Hypokalemia may cause cardiac arrhythmia and may also sensitize or exaggerate the response of the heart to the toxic effects of digitalis (e.g. increased ventricular irritability). In diabetic patients, dosage adjustments of insulin or oral hypoglycemic agents may be required. Hyperglycemia may occur with thiazide diuretics. Thus latent diabetes mellitus may become manifest during thiazide therapy. Thiazides have been shown to increase the urinary excretion of magnesium; this may result in hypomagnesemia. Thiazides may decrease urinary calcium excretion. Thiazides may cause intermittent and slight elevation of serum calcium in the absence of known disorders of calcium metabolism. Marked hypercalcemia may be evidence of hidden hyperparathyroidism. Thiazides should be discontinued before carrying out tests for parathyroid function. Valsartan: As a consequence of inhibiting the renin-angiotensin-aldosterone system, changes in renal function may be anticipated in susceptible individuals. In patients whose renal function may depend on the activity of the renin-angiotensin-aldosterone system (e.g. patients with severe congestive heart failure), treatment with angiotensin converting enzyme inhibitors and angiotensin receptor antagonists has been associated with oliguria and/or progressive azotemia and (rarely) with acute renal failure and/or death. Similar outcomes have been reported with valsartan and hydrochlorothiazide. In studies of ACE inhibitors in patients with unilateral or bilateral renal artery stenosis, increases in serum creatinine or blood urea nitrogen have been reported. In a 4-day trial of valsartan in 12 patients with unilateral renal artery stenosis, no significant increases in serum creatinine or blood urea nitrogen were observed. There has been no long-term use of valsartan in patients with unilateral or bilateral renal artery stenosis, but an effect similar to that seen with ACE inhibitors should be anticipated. Hydrochlorothiazide: Thiazides should be used with caution in severe renal disease. In patients with renal disease, thiazide may precipitate azotemia. Cumulative effects of the drug may develop in patients with impaired renal function. The antihypertensive effect of Co-vasotec may be increased with concomitant use of other antihypertensive drugs. Concomitant use with potassium-sparing diuretics, potassium supplement or salt substitutes containing potassium or other drugs that may increase serum potassium (e.g. heparin ) require caution and monitoring of potassium levels. Reversible increases in serum lithium concentrations and increased toxicity have been reported in connection with concurrent use of lithium with ACE inhibitors and thiazides diuretics. There is no experience with concomitant use of valsartan and lithium. Regular checking of the serum lithium level is therefore recommended in the event of co- administration of lithium and Co-vasotec. No clinically relevant interactions were found between valsartan alone and any of the following drugs: cimetidine, warfarin, furosemide, digoxin, atenolol, indometacin, hydrochlorohiazide, amlodipine, glibenclamide. Concomitant administration of non-steroidal anti-inflammatory drugs (e.g. salicylic acid derivatives, indometacin) may attenuate the diuretic and antihypertensive activity of the thiazide component of Co-vasotec. Acute renal failure may be inducing patient with concurrent hypovolaemia. Potassium and/or magnesium loss may be exacerbated by concomitant use with potassium-depleting diuretics (e.g. furosemide). Glucocorticoids, ACTH, amphotericin B, carbenoxolone, penicillin G, or salicylates. Thiazide-induced hypokalaemia or hypomagnesemia may increase the risk of arrhythmia in patients taking cardiac glycosides. Thiazide diuretics increase the effect of curare-type muscle relaxants. Adjustment of the dosage of insulin or oral antidiabetic agents may be necessary. Co-administration with thiazide diuretics may increase the frequency of hypersensitivity reactions to allopurinol. The risk of amantadine-induced unwanted effects may increase. Thiazides may also potentiate the hyperglycemic effect of diazoxide. Thiazides may reduce the renal excretion of cytostatic drugs (e.g. cyclophosamide, methotrexate) and thus increase their myelosuppressive effects. The bioavailability of thiazide diuretics may be increased by concomitant administration of anticholinergic agents (e.g. atropine, biperiden); probably as a result of reduced gastrointestinal motility and delayed gastric emptying. There have been isolated reports of hemolytic anemia in connection with concomitant use of hydrochiorothiazide and methyldopa. The absorption of thiazide diuretics is decreased by colestyramine colestipol. Co-administration of thiazide diuretics with vitamin D or calcium salts may enhance the hypercalcaemic effect. Concomitant use with ciclosporin may increase the risk of hyperuricaemia and give risk to symptoms of gout. Co-vasotec is strictly contraindicated during pregnancy. Fetal damage and death have been reported in association with use during the second and third trimesters of drugs that directly affect the Rennin-Angiotensin Aldosterone System (RAAS); human fetal renal perfusion, which is dependent on the development of the RAAS, begins during the second trimester. The risks associated with valsartan treatment are therefore higher during the second and third trimesters. Like other drugs that act directly on the RAAS, Co-vasotec should not be used during pregnancy. It should be discontinued if pregnancy is confirmed during treatment. Adequate urine excretion, hyperkalaemia and blood pressure should be carefully examined in all neonates exposed to the drug in utero. If necessary, appropriate medical steps (e.g. rehydration) must be taken to remove the drug from the circulation. Intrauterine exposure to thiazide diuretics may cause fetal or neonatal thrompocytopenia and be associated with adverse effect reactions different from those occurring in adults. It is not know whether valsartan passes into human breast milk. It s excreted in the milk of lactating rats. Hydrochlorothiazide crosses the placental barrier and is excreted in breast milk. There have been no studies in breastfeeding woman and Co-vasotec should therefore not be used during lactation. Like other antihypertensive, Co-vasotec may impair the reactions and the ability to drive and to operate tools and machines, therefore, caution is recommended. Gastrointestinal disorders: Dyspepsia, diarrhea, flatulence, dry mouth, nausea, upper abdominal pain, and vomiting. General disorders and Administration site conditions : Asthenia, chest pain, fatigue, peripheral edema and pyrexia. Infections and Infestations: Bronchitis, bronchitis acute, influenza, gastroenteritis, sinusitis, upper respiratory tract infection and urinary tract infection. Musculoskeletal and Connective tissue disorders: Arthralgia, back pain, muscle cramps, myalgia, and pain in extremity. Nervous System disorders: Postural dizziness, paresthesia, and somnolence. Psychiatric disorders: Anxiety and insomnia. Renal and Urinary disorders: Pollakiuria. Reproductive System disorders: Erectile dysfunction. Respiratory, Thoracic and Mediastinal disorders: Dyspnea, cough, nasal congestion, pharyngolaryngeal pain and sinus congestion. Skin and Subcutaneous tissue disorders: Hyperhidrosis and rash. Abnormal vision, anaphylaxis, bronchospasm, constipation, depression,dehydration, decreased libido, dysuria, epistaxis, flushing, gout, increased appetite, muscle weakness, pharyngitis, pruritus, sunburn, syncope, and viral infection. Digestive disorders: Pancreatitis, jaundice (intrahepatic cholestatic jaundice), sialadenitis, cramping, gastric irritation. Hypersensitivity: Purpura, photosensitivity, urticaria, necrotizing angiitis (vasculitis and cutaneous vasculitis), fever, respiratory distress including pneumonitis and pulmonary edema, anaphylactic reactions. Metabolic disorders: Hyperglycemia, glycosuria, hyperuricemia. Renal disorders: Renal failure, renal dysfunction, interstitial nephritis. Skin disorders: Erythema multiforme including Stevens-Johnson syndrome, exfoliative dermatitis including toxic epidermal necrolysis. Special Senses disorders: Transient blurred vision, xanthopsia. Hypersensitivity: There are rare reports of angioedema. Digestive disorders: Elevated liver enzymes and very rare reports of hepatitis. Renal disorders: Impaired renal function. There has been no experience thus far of overdosage with valsartan+hydrochlorothiazide; The main sign of overdose would probably be marked hypotension. The following signs and symptoms may also occur as a result of hydrochiorothiazide overdosage: nausea, drowsiness, hypovolaemia, and electrolyte disturbances, associated with arrhythmias and muscle cramps. Management depends on the time since ingestion and the type and severity of the symptoms, with measures to stabilize the circulation taking priority. Vomiting should be induced, if ingestion is recent. If the interval since ingestion is longer, an appropriate quantity of activated charcoal should be administered. If there is hypotension, the patient should be placed in the supine position and rapidly given fluid and electrolyte replacement. Valstran cannot be removed by haemodialysis because of its strong plasma protein binding. Clearance of hydrochlorothiazide can, however, be achieved by this means. Valsartan: The active hormone of the Rennin-Angiotensin-Aldosterone System (RAAS) is angiotensin II, which is formed by angiotensin-coverting enzyme (ACE) from angiotensin I. Angiotensin II binds to specific receptors located in the cell membranes of various tissues. It has a wide rang of physiological effects, including in particular both direct and indirect environment in the regulation of blood pressure. As a potent vasoconstrictor, angiotensin II exerts a direct pressor effect. It also promotes sodium retention and stimulates aldosterone secretion. Valsartan is an orally active and specific angiotensin (AT) II receptor antagonist . It acts selectively on the ATI receptor subtype, which is responsible for the known actions of angiotensin II. The increased plasma levels of angiotensin II following AT1 receptor blockade with valsartan may stimulate the unblocked AT2 receptor which appears to further counterbalance the effect of the AT1 receptor. Valsartan exhibits no partial agonist activity at the AT1 receptor. Its affinity for the AT1 receptor is approximately 20,000 times greater than to the AT2 receptors. Valsartan does not inhibit ACE (= kininase II), the enzyme that converts angiotensin I to angiotensin II and degrades bradykinin. Angiotensin II antagonist are unlikely to cause cough since they have no effect on ACE and do not potentiate bradykinin or substance P.
Hydrochlorothiazide: The principal site of action of thiazide diuretics is the early distal tubule. It has been shown that a high-affinity receptor in the renal cortex acts as the primary binding site and site of action of the thiazide diuretics, which inhibit NaCl transport in the early distal tubule. The mode of action of thiazides involves inhibition of the NaCI symporter. Competing for the CI site may affect electrolyte reabsorption. This results directly in increasing sodium and chloride excretion and indirectly in a reduction of plasma volume. With consequent increases in plasma renin activity, aldosterone increases secretion and potassium excretion, and a fall in serum potassium. Since the rennin-aldosterone link is mediated by angiotensin II, co-administration of an angiotensin II receptor antagonist results in a reduction in the potassium loss associated with thiazide. Absorption of valsartan following oral administration is rapid, although the amount absorbed varies considerably. The mean absolute bioavailability of valsartan is 23% (range 23±7) its pharmacokinetics are linear in the dose range studied. When given once daily, valsartan showed little accumulation. Plasma concentrations were found to be similar in males and females. Ingestion with food reduces the area under the valsartan plasma concentration curve (AUC) by 48% and Cmax by 59%. However, plasma concentrations are similar from about 8 hours onwards for ingestion with or without food. The reduction in (AUC) and Cmax is not accompanied by a clinically significant reduction in therapeutic effect, and valsartan can therefore be taken either with or without food. Distribution: Valsartan is extensively (94-97%) bound to serum proteins, primarily albumin. Steady state is reached within 1 week. The volume of distribution at steady state is approx. 17 liters. Plasma clearance is relatively slow (about 30 liters/ hour). Elimination: Valsartan displays multiexponential decay kinetics (primary half- life < 1 hour, terminal (beta) half-life approx. 9 hours). Approx. 70% absorbed valsartan is excreted in the feces and 30% in the urine, mainly as unchanged compound. Absorption: Hydrochlorothiazide is rapidly absorbed following oral administration (tmax approx. 2 h). Distribution and Elimination: The distribution and elimination kinetics of hydrochlorothiazide are bioexponential with half-life of 6-15 h.
The increase in mean AUC is linear and proportional to the dose in the therapeutic range. The kinetics of hydrochlorothiazide do not change with repeated administration. Expected accumulation is minimal with once-daily administration. The absolute bioavailability of hydrochlorothiazide is 60-80% after oral administration. More than 95% of the absorbed dose is excreted unchanged in the urine. Concomitant ingestion with food as opposed to ingestion without food, has been reported to both increase and decrease in systemic availability of hydrochlorothiazide. These effects are slight and of little clinical significance. Valsartan/Hydrochlorothiazide: The systemic availability of hydrochlorothiazide is reduced by about 30% when co-administrated with valsartan. The kinetics of valsartan are not affected to any significant extent by co-administration with hydrochlorothiazide; the observed interaction has no impact on the combined use of valsartan and hydrochlorothiazide since controlled clinical trails has shown a clear antihypertensive effect, greater than that obtained with either drug alone. Store at a temperature not exceeding 30°C, in a dry palce. Co-vasotec 80/12.5 mg F.C. Tablets: Box containing 2 (Al/PVC) blisters of 7 F.C. tablets each. Co-vasotec 160/12.5 mg F.C. Tablets: Box containing 2 (Al/PVC) blisters of 7 F.C. tablets each. Co-vasotec 160/25 mg F.C. Tablets: Box containing 2 (Al/PVC) blisters of 7 F.C. tablets each.